Income and wealth inequality is only getting worse. It’s not hard to understand why. Certain corporations have a lock on economic activity throughout the world. Mom and Pop operations have been forced out of business or have merged with the Big Guys. Artificial intelligence, automation, robots, and computers have taken over many menial but used-to-be-better-than-minimum-wage jobs like check-out clerks, bank tellers and customer service operators. Other jobs have been offshored to cheaper labor jurisdictions. The rest of us, college graduates included, have been reduced to being expendable appendages of the large corporate machines to be sucked in and spit out at their pleasure. When our skill sets are outmoded, we will be laid off and fresh talent will be acquired. The job pool is shrinking because the number of necessary jobs is shrinking. Today, there are approximately 1.2 million fewer jobs in mid-and higher-wage industries than there were prior to the 2008 recession while there are 2.3 million more jobs in lower-wage industries. According to the Bureau of Labor Statistics most jobs in the next decade won’t even require a college education. They are jobs that can’t be done by robots: care givers, nurses, house cleaners, gardeners, retail. Another reason for income and wealth inequality is that the US Federal Reserve’s quantitative easing policy screws savers who get zero interest on their life savings while injecting money into the largest Wall Street banks. This money is siphoned off by wealthy investors and hedge funds. It never enters the real economy. It only encourages the average Joes and Janes to take on more debt. Ninty percent of the money supply is created by private banks who loan money into the economy through their policy of fractional reserve banking. As the money supply increases, so does debt. Fractional reserve banking is a simple concept that has become more complicated and convoluted as it has evolved over the years. In its simplest terms, if a bank takes in a deposit of $100 from 10 people or $1000 total, it loans out $900 of that keeping $100 back as a reserve in case someone wants their deposit back before the principal and interest on the loans start flowing in. Their premise is that not everyone will demand their deposit back at the same time. If, however, everyone does want their money back at the same time, there could be a run on the bank unless the bank can borrow the money from some other entity like another bank or the Federal Reserve. Thus money is created by the bank with a few keystrokes on a computer and is fed into the economy as debt. The banks are at the top of the food chain since they create the money and loan it out on interest. Thus, the US economy is a debt based economy. Bad things happen when people all demand their money back at the same time or collective debt becomes so big and untenable that it can’t be paid back. This is what happened in the 2008 financial crisis when mortgages were given to people who couldn’t pay them back and hence defaulted. Eventually this whole financial structure, which was a house built upon sand instead of a rock, to use a Biblical metaphor, collapsed. It is to be noted that when a bank creates money, it is not backed by gold. Nixon took us off the gold standard in 1971. Money not based on anything but the government’s say so is called fiat money. Thus all money created by private banks is fiat money, and, although the government says it is all good, it is the private banks that actually create it, not the supposedly democratically elected government. The Federal Reserve has also been involved in money creation recently with a process called quantitative easing (QE). When the government needs money beyond the revenues it takes in by means of taxes, it goes into debt by issuing bonds. Sometimes those bonds are bought by Joe and Jane Average Investor or sometimes by other countries like Japan. However, much of the time they are bought by Wall Street banks. Then the Federal Reserve turns around and pays cash for those bonds taking them off the hands of the big banks. The result is that the banks end up with more money and the loans disappear on the Federal Reserve’s balance sheet which is sort of like a black hole. Effectively, the government never has to pay those loans back. There is another way that money could be created and injected into the economy. It might be called quantitative easing for the people (PQE) as Britain’s Leader of the Labor Party, Jeremy Corbyn has termed it. He proposes to give the Bank of England a new mandate to upgrade the economy to invest in new large scale housing, energy, transport and digital projects. The investments would be made through a National Investment Bank set up to invest in new infrastructure and in the hi-tech innovative industries of the future. The money creation (or printing if you like) would entail the government issuing a bond that a National Investment Bank would buy. Then the central bank would take that loan on its balance sheet in return for cash that the bank would then use to pay for infrastructure. The end result is that the government would owe the central bank the amount of the loan, but because the central bank is a financial black hole, it would never have to pay. LOS ANGELES, CA- At a lively downtown rally in front of the Bank of NY Mellon in Los Angeles, the Fix LA Coalition unveiled a groundbreaking research report, entitled “No Small Fees: LA Spends More on Wall Street than Our Streets,” revealing that Wall Street charges the City of Los Angeles more than $200 million in fees. Coalition members called for action to reduce the high fees and put that money back into neighborhood services. After the rally, Fix LA Coalition members delivered the report to elected officials in City Hall. LA is not the first and probably won’t be the last to be tricked into engaging in a fancy derivative deal that was way over the heads of the city employees that were talked into it by Wall Street hit men. If they had formed their own Public Bank of Los Angeles, they could not only have avoided being ripped off, but they could have actually made money and then be in a position to fix all those potholes they’ve been screaming about. And they could have created their own money supply the way Wall Street does it: fractional reserve banking. The motion further calls on the banks to return unfair profits and fees paid since 2008, estimated at more than $65 million to date. The deal costs taxpayers $4.9 million annually. Los Angeles is now spending $290 million a year in financial fees or more than the entire city budget for maintaining its vast array of streets and highways. LA isn’t the only sucker to enter into an interest rate swap in 2007 which was essentially a bet that interest rates would not fall below 2%. Then when the Federal Reserve, with its policy of QE, lowered interest rates to zero, LA and many other jurisdictions found themselves on the wrong end of a bet and were forced to shell out much more than they would have if they had kept the interest rate on the original loan. The next sucker: Puerto Rico. Puerto Rico ran itself into debt and then tried to make up for it with interest rate swaps. Recent credit downgrades allowed Wall Street to demand hundreds of millions more in short-term lending fees, credit-default-swap termination fees, and higher interest rates. Between 2012 and 2014, Puerto Rico paid nearly $640 billion to terminate swaps in addition to $12 million annual swap payments. As a result Puerto Rico is in the same situation as Greece – borrowing money in order to make debt payments which is the same as borrowing money on one credit card to make the payments on another. The Chicago Public School Teachers’ Pension and Retirement Fund has brought suit against 10 of Wall Street’s biggest banks including Goldman Sachs, JPMorgan Chase, Citigroup and Bank of America for colluding to prevent the trading of interest rate swaps with the result that it cost the Fund more money. I could go on … about Birmingham, San Bernadino, Stockton and others … but I won’t. If these jurisdictions – whether they be cities, counties or states – formed public banks as the state of North Dakota did, there would be no outflow of cash to Wall Street. Money would stay at the local level and could be used to support local businesses and create jobs repairing and building infrastructure. If the government creates money and puts it in an infrastructure bank, that money would be spent into the economy by creating jobs to build and repair infrastructure. Thus, good jobs would be created at the low and middle parts of the economic spectrum. This money would have a multiplier effect as the job holders would spend their paychecks on the necessities and luxuries of life. American GDP is based on 70% consumer spending so that would go up. Thus the democratically elected government – not private banks – would be in charge of creating the money supply and it would be to the advantage of average workers, not high-end financiers. Since the big banks are the current recipients of the QE largesse, that money goes into the pockets of billionaires in various ways and drives wealth and income inequality. Or the government, instead of the private Wall Street banks, could create money itself directly and inject it into the economy in a variety of ways as Abraham Lincoln did when he had the American government create and spend greenbacks into the economy. This money, therefore, does not create debt as money created by private banks and loaned into the economy does. It’s a bottom up rather than a trickle down method. Problem is that most money created today does not trickle down into the real economy. It cuts out the private sector bond traders from their dose of corporate welfare which unlike other forms of welfare like sickness and unemployment benefits etc. has made the recipients rich in the extreme. . . . So the government could just create money and inject it into the economy in one of two ways: directly to the people in the form of a basic guaranteed income or through an infrastructure bank that creates jobs. In the first instance money would be transferred directly to people to bolster consumption. In the second case, jobs would be created that would get needed work done. Or a combination of both could be used. A third way of reducing income inequality would be to redistribute money from the 1% to the 99% through the tax code. This is the method that Bernie Sanders advocates. Taxes on wealth and financial transactions would provide additional monies which could be transferred to the 99% through social programs such as Medicare-For-All, or it could be given directly in terms of a deposit to checking accounts as was done in the Economic Stimulus Act of 2008. Money was deducted from tax liabilities or deposited directly to American citizens. The concept of a Basic Income in the U.S. goes back to Thomas Paine, one of the driving forces for independence and reducing inequality during the American Revolution. More recently, it’s been supported by very non-liberal individuals like Fredrick Hayek, Milton Friedman, and Richard Nixon. This would eliminate poverty in one fell swoop. All the anti-poverty programs could be rolled into one with much fewer administrative costs. Just as Medicare-For-All would simplify and reduce medical costs, a basic guaranteed income would amount to Social-Security-For-All. The state of Alaska already has such a program called the Alaska Permanent Fund which hands out money to each resident on an annual basis. In 2015 each man, woman and child received $2,072.00. For a family of four that was a nice basic income of approximately $8000. Sweet! In the Netherlands a number of cities are experimenting with a basic income after the city of Utrecht announced that it would give no-strings-attached money to some of its residents. Tilburg, a city of 200,000 inhabitants close to the border with Belgium, will follow Utrecht’s initiative, and the cities of Groningen, Maastricht, Gouda, Enschede, Nijmegen and Wageningen are also considering it. A recent study conducted in 18 European countries concluded that generous welfare benefits make people likely to want to work more, not less. In Switzerland, the necessary 100,000 signatures have been obtained for holding a referendum on whether Swiss citizens should receive an unconditional basic income of €2,500 per month, independently of whether they are employed or not. Other countries such as Finland and Catalonia are also moving in the direction of a no-strings-attached guaranteed income. This would do more to reduce inequality and poverty than perhaps any other measure. If Tilburg’s basic income project gets the green light from Netherland’s state secretary of social affairs, the town will provide an extra paycheck to a pilot group of 250 people starting in January 2016, Tillburg officials said. The city has not confirmed the amount of the stipend, but in Utrecht checks will range from around €900 ($1,000) for one adult to €1,300 ($1,450). Although the classic basic income theory proposes universal payments across the population, the two Dutch experiments will only focus on residents who are already recipients of social assistance. Those in the program will be exempt from the severe job-seeking requirements and penalties in Dutch law. Authorities aim to test how citizens react without that sword of Damocles over their heads. Will the money encourage them to find a job or will they sit on their couches comfortably? A guaranteed income could be means tested. Why not? Rich people don’t need an extra $1000. a month. It would reduce poverty, increase consumption and bolster GDP. Rich corporations would probably increase the price of staples as people had more money to buy them causing inflation. That’s why the behemoth worldwide franchise operations need to be broken up so they don’t collude to raise prices on staples thus defeating the purpose of the basic income. With fiat money entering the real economy instead of the billionaire economy, inflation could become a concern. Hyperinflation is always a concern when fiat money is created. When that money is spent by consumers, it will still wind up in the hands of a few major corporations, and that would be a problem. They could just keep raising prices. That’s why breaking up those large behemoths by using the Sherman Anti-Trust Act is important. Money can also be pulled back by the government by taxation if inflation threatens to get out of hand. However, when fiat money ends up in the pockets of billionaires as has been the case with QE, inflation is not a concern because it doesn’t enter the real economy and prices don’t rise. 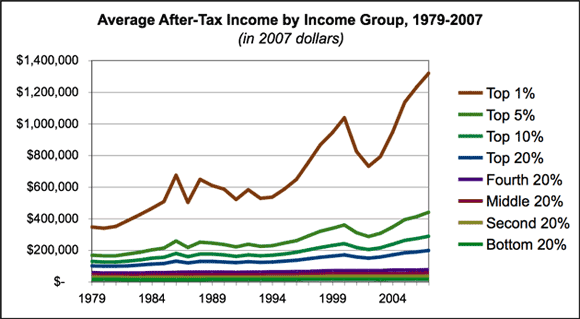 Income inequality though becomes a major concern as does the influence of big money on the political system. Billionaire money has bought and paid for the political system through lobbying and campaign donations with the result that the US is effectively no longer a democracy but a plutocracy. One of the main advantages of a universal basic income is that it would free people from the tyranny of the job market in which they are mere commodities by guaranteeing the most basic human right of all, that of material existence. With inequality increasing some way or ways must be found to redress the balance. The alternative is to wake up and find ourselves in a neo-feudal society controlled by a few behemoth corporations employing only a few high-level people at good wages. The rest of the population would be employed in low-level service type jobs and live in relative poverty. What money they had would be spent in the troughs of the giant corporations and end up in the pockets of the 1%. Even if the 99% were given money to spend, it would still end up there – in the pockets of a few. An infrastructure bank funded by government created fiat money would provide people with decent jobs in which workers could maintain a sense of dignity and improve the quality of the nation’s infrastructure at the same time. In addition recipients of a basic income should have to give something back in terms of creating a better life for poor people around the world. Instead of armies with guns and weapons which have cost trillions and produced mainly negative results, a Peace Army could help poor people around the globe attain at least a minimally acceptable lifestyle in terms of clean water and sanitation, adequate nutrition, energy and education. Installing solar around the world will not only provide energy for people who don’t have anything but the most primitive kind while cleaning up the environment at the same time. The commitment of rich nations to help poorer nations convert to renewable energy could be manifested by funding unemployed and underemployed Americans to help build such infrastructure around the world. It’s not good for people to be idle. If they have no other job, they should at least be required to perform community service. If they have another job so that the basic income is just a supplement, this would be the ideal situation. Income inequality will only increase as long as Wall Street banks control the money creation process, and the rest of US citizens keep going into debt whether it be with mortgages, student loans, car loans or credit cards. Local jurisdictions should take back the money creation process from Wall Street by creating their own public banks. Then the people will have the say in who gets the QE. Was it the banks or Clinton that pushed NAFTA? Was it the banks or was it Obama that is pushing TPP? Was it the banks or was it Jerry Brown that raised the sales tax to just under 10%? Was it the banks or was it the State of California that has raised gasoline prices to pay for the bullet train? Was it the banks or was it the City Water Department that raised rates 17% after the poor and middle class cut back on water use? Was it the banks or was it public universities that raise tuition faster than inflation? Seems to me, income inequality has increased by the direction of and the size of government and their demands for more money. “The trouble with Socialism is that eventually you run out of other people’s money.” M.T.